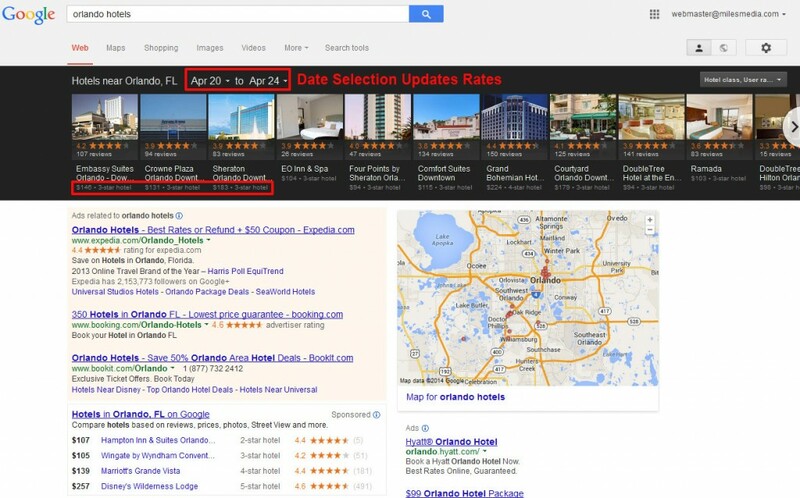 Back in the good ol’ days… say a year ago… a search for “Orlando hotels” brought up three things: paid ads, Google local listings (with a map) and organic listings. From here, the visitor would typically soon leave Google for a hotel’s website, TripAdvisor or an OTA. With recent changes to the Google Knowledge Graph Carousel for the hotel industry, Google has continued to steadily expand its role in the travel planning process. 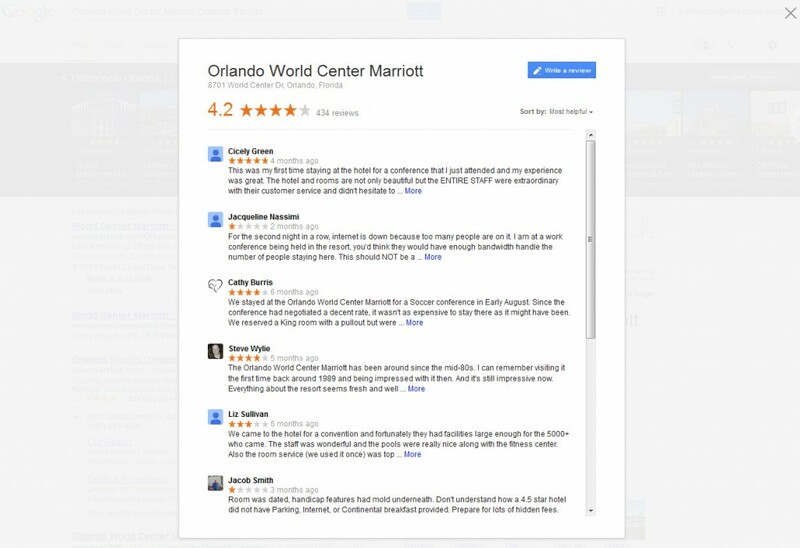 I’m going to take you on a visual tour of what happens when searching for “Orlando hotels” today to demonstrate how a Google visit that used to last seconds will now go on for several minutes. 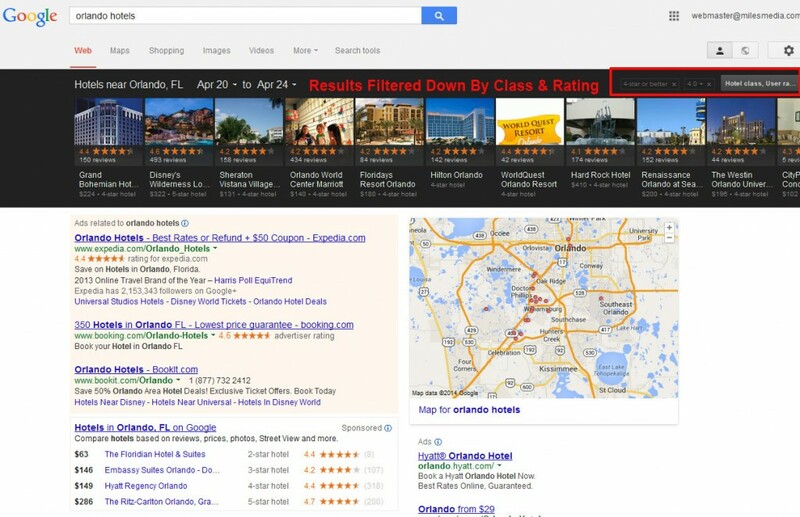 Launched by Google in June, Knowledge Graph Carousel (typically just called “Carousel”) displays a hotel’s name, photo, star rating and number of reviews in a black box at the very top of the SERP (Search Engine Results Page) and can be scrolled horizontally to show a total of 22 listings. Since June, there has been much debate over what factors determine who is listed in Carousel and in what order. While still an organic listing, ranking seems to depend heavily on the quantity and quality of Google reviews and maintaining a robust Google+ account. At the end of January, search and sorting capabilities were added inside of Carousel for lodging-specific search results. So our search begins for “Orlando hotels.” The primary new feature is that we can now enter our travel dates directly into Carousel: April 20 to April 24. When dates are selected, the page refreshes (another impression for paid search ads), but the order of the results in Carousel does not change. What does change is the rates listed under the hotel name. In addition, the Google Hotel Finder box beneath the ads also updates with new rates and properties. We know visibility in Hotel Finder is controlled by bidding, much like standard text ads, so these changes reflect both price/availability and who is bidding highest. Another new feature within Carousel is the ability to narrow the Carousel results by either Hotel Class (industry star rating) or User Rating (traveler review-based star rating). We only want 4-star and above properties with a 4-star or better review rating. After applying these filters, the page refreshes again (another impression for paid search ads). The Carousel results do not change in order, but some are eliminated and those that match the criteria move left. The selection in Google Hotel finder has refreshed again, but does not seem to correspond to our filters, as it is showing 2- and 3-star hotels. Another new feature of Carousel is that it can now be used as a navigation tool as we further narrow our search. When we click on specific properties, the page refreshes (another paid search impression, but branded this time), but Carousel does not disappear from the screen as it used to. Our results stay in place and we can continue down the line to review the SERP pages for each of the options. The page is now a SERP for “hotel name + city, state” and includes the detailed Knowledge Graph for the property on the right hand part of the page. What now? We have lots of options. Within the Knowledge Graph (notably, the most visually attractive area of the page besides Carousel), we can further research the property. The integrated Hotel Finder rates drop-down menu shows us the prices on the various OTAs (and possibly the property’s website). If we click on Reviews, we can read all of the Google reviews for the property, as well as sort them by most helpful, recent or high/low score. (You can see that the SERP and Carousel remain ghosted in the background). We can also explore the photo gallery, check map location and, for some properties, see outside or inside views. We have narrowed it down to the Orlando World Center Marriott. Now we are finally ready to leave Google. (Notice how long we’ve been here?) Will we click on the branded ad for “Deals up to 55% off”? 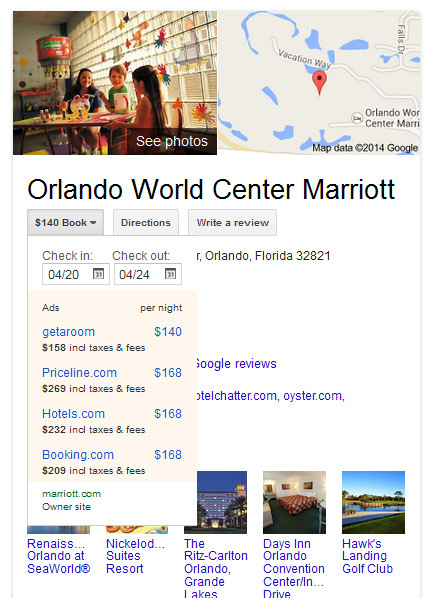 Will we click through to Priceline to book from the Knowledge Graph (Google charges number of nights searched x CPC)? Will we go to the property’s official site via their organic listing? TripAdvisor? Expedia? What is certain is that Google is not done testing and expanding in the hospitality arena and TripAdvisor, Expedia and their peers are watching warily. Hotels and resorts can expect to see less organic traffic from broad terms like “Orlando hotels” and potentially more from “hotel name + city, state” (though with secure search in place it becomes difficult to discern). A property’s ranking in Google Carousel becomes much more critical for these broad terms than traditional ranking. This means encouraging more customers to review you on Google and creating a content-rich Google+ profile. And, of course, keep an eye on this blog.